This episode was based on the short story 'The Mystery of Hunter's Lodge', first published in 1923. 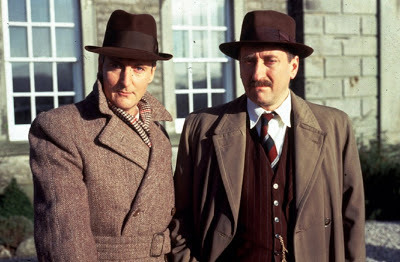 It was adapted for television by T. R. Bowen (who, incidentally, wrote the screenplay for several of the Joan Hickson Miss Marple episodes) with Clive Exton as script consultant, and was directed by Renny Rye. The adaptation stays largely faithful to its source text, with some notable additions. The main change concerns Poirot and Hastings, who in this version attend the shoot at Hunter's Lodge (Hastings is a friend of Roger Havering, it seems, and Poirot is looking forward to a delicious meal at the local hotel/B&B). Like in the original short story, he is bedridden with a cold (or "a deadly fever" as he calls it). Several other suspects are added to the plot, including a nephew of Pace, Archie, who is a school teacher with a strong dislike of his uncle, and a half-brother of Pace, the gamekeeper, who wants to marry one of the maids at the Lodge but is unable to because Pace denies him money. Also, the actual murder plot is significantly expanded. The bearded man is seen leaving the train at a nearby train station, and stealing the station master's bicycle, and Roger Havering's alibi in London concerns gambling debts (mentioned briefly in the short story). In sum, though, the episode is largely faithful to the source material, and the added suspects and expanded denouement points make complete sense. Rye's directing is competent, and he makes good use of the moor location. The house used as 'Hunter's Lodge' is in reality Casterne Hall in Derbyshire. The soundtrack works well for the episode. It's nice to see Poirot's interest in food referred to again. As are the references to his hypochondria, his dislike of the countryside and his grumpiness when tired and cold (again, proof that his temper in Murder on the Orient Express wasn't a one-off). Of the guest actors, there are no real standouts. Diana Kent (Zoe Havering) is good, but she doesn't quite convince in the disguise as Mrs. Middleton (but, of course, such disguises are always difficult to pull off on screen anyway). Suchet says in "Poirot and Me" that he actually caught a cold while filming this; he says "I always seemed to catch whatever [illness] Poirot was supposed to have." Yes I read that also in his book which was another fascinating look into his life portraying him.